VISA, the largest U.S. credit card network said it is looking to raise $1o billion in an initial public offering, according to a registration statement with the SEC. They plan to take a portion of the IPO proceeds to pay settlements or judgments related to litigation settlements. For example, VISA agreed to pay American Express up to $2.07 billion to settle a lawsuit alleging the company illegally stifled competition. I am excited for the VISA IPO along with many investors after the success of Mastercard (MA). I entered Mastercard after its first major run but still managed to make a handsome profit with my buy above $107. 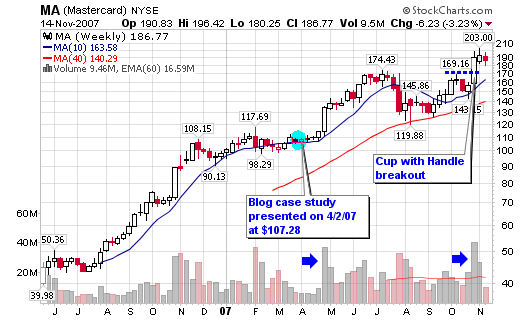 The stock currently trades at $186.77 and recently broke out a cup with handle base above the pivot point of $169.26. NO RISK for VISA; the banks are responsible for the cardholders that don’t pay their bills. What could be better than that? Tell me! Everyone talks about Visa IPO. Everyone impatiently waiting for 2008. The demand is huge. I wonder what it is going to be priced at. 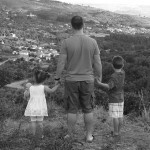 Chris, I am excited about this one as well. I have heard that the timeframe has been accelerated and an IPO may happen before the end of the year. Have you heard anything about a definite time for this IPO? How would a small time investor get a hold of a few IPO shares? We, the small time retail investors, must wait for the IPO to debut! I have not heard anything about an actual date but believe it will be in 2008. This could turn out to be a potential disappointment when everyone is excited about this ipo. Now that people know about how “hot” Mastercard was, it’s not going to be easy money anymore for people that will have to buy after the ipo. Remember how “hot” the exchange stocks were in 2006, and the Nymex ipo? Everyone was excited, and NMX ipo did deliver (hottest ipo in 2006), however, only people that bought BEFORE the ipo made money. The stock more than doubled on its debut, but since then has gone sideways. I’m not not saying that Visa won’t go up long term from its ipo, but unless you’re a long term investor, buying it after the ipo may not deliver quick satisfying result as most traders want. What you say may be very true but companies that make money go up over time and that is what I do – trade time. I am not a day trader and I am not looking for short term (satisfying) results. A lot of people thought I was nuts to buy GOOG at $172. They said it was just a post dot com internet stock. They were wrong because that company makes money hand-over-fist! Visa IPO! The most great event i wait.. 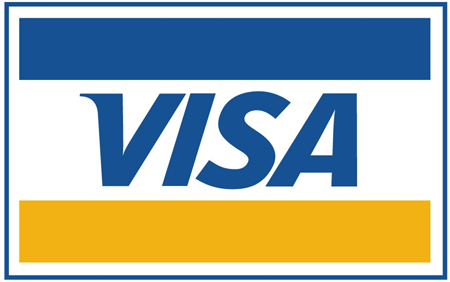 But since 2006, i still do not know when visa will officialy go public and the “V” symbol will be listed on NYSE. Does anyone now when exactly visa will go public?